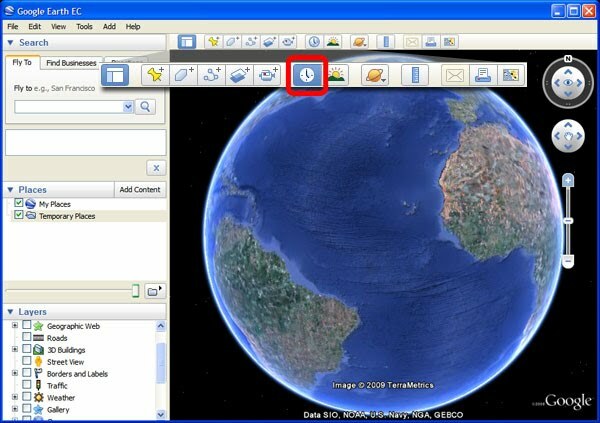 A new feature in the recently released Google Earth 5 allows you to view all the historical imagery in Google Earth’s imagery archive. Included in the imagery archive is all imagery previously shown in Google Earth, as well as a selection of Landsat satellite imagery since 1972. 1. Click on the clock in the Toolbar. You'll see a time slider appear with tick marks wherever there is historical imagery in Google Earth for the area you're viewing. 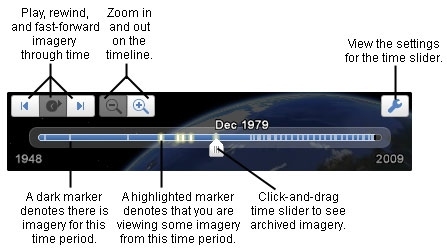 The time slider contains several tools that allow you to view archived historical imagery. 2. Try it out for yourself! Zoom into San Francisco. See how the city has changed over time!